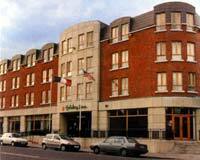 The Holiday Inn is a very comfortable hotel of a superior standard which located just minutes walk from the heart of Dublin city centre. The hotel offers well appointed bedrooms, good food and excellent service. It is also home to a good gym which is available for use by guests aged eighteen years and over. Each of the hotels 92 well appointed en suite rooms come complete with televisions, direct dial telephones, fax/modem lines, hairdryers, trouser presses and more. Executive guest rooms with larger living areas and mini bars, as well as rooms for individuals with disabilities and designated non smoking rooms are also available. 24-hour room service is available. The hotel's restaurant serves good food from a range of Irish and European menus, which has been prepared using fresh ingredients. With a choice of snacks, bar food, room service or a three course meal you'll never find yourself short for a place to eat. The Holiday Inn is located minutes from the heart of Dublin City Centre, and just ten minutes stroll from Grafton Street, The National Gallery, the Natural History Museum, and many other visitor attractions. The Gaiety & Olympia Theatres, fashionable Temple Bar and O'Connell Street are nearby.